Besides me, I know at least three other couples that are expecting babies this year. I therefore am going to let myself knit some not necessarily gender neutral items even though I don't know the gender. I know that the number of people I have to knit for is only going to grow, so having some extras in my stash until I know all of the genders (or which ones will be a surprise at birth) is a good idea.) The Upside-Down Daisy Baby Hat is available for free online, or you can find it in the book Itty-Bitty Hats: cute and cuddly caps to knit for babies and toddlers . Even the underside of the hat looks awesome! 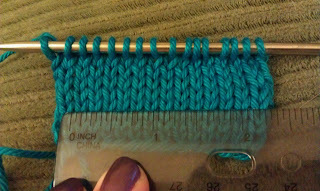 I am knitting with KnitPicks Shine Sport in Aquamarine, Grass and Cream (actual color name unknown) on size 5 knitting needles. 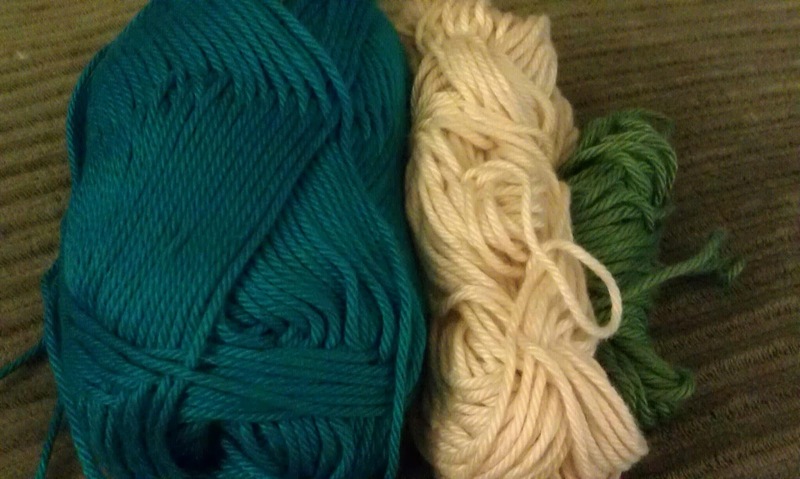 I'm using yarn that is smaller than what the pattern calls for because that is what I have in my stash. I therefore whipped up a quick gauge swatch. My project is 6 sts/inch. 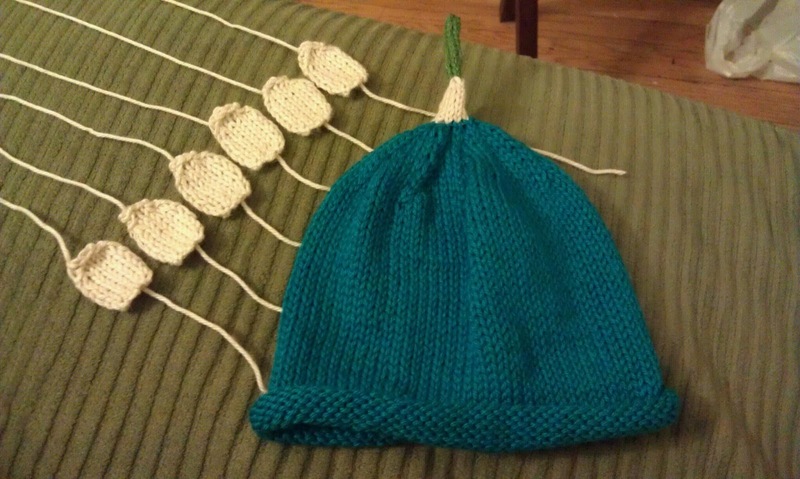 Based on the reported gauge (5 sts/inch) and the reported stitch counts (56, 64, 72) the hats should measure (11.2", 12.8", 14.4"). 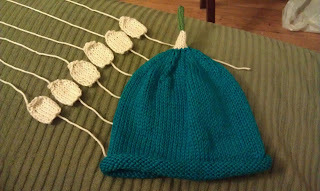 With my gauge these same hats would measure (9.3", 10.6", 12"). 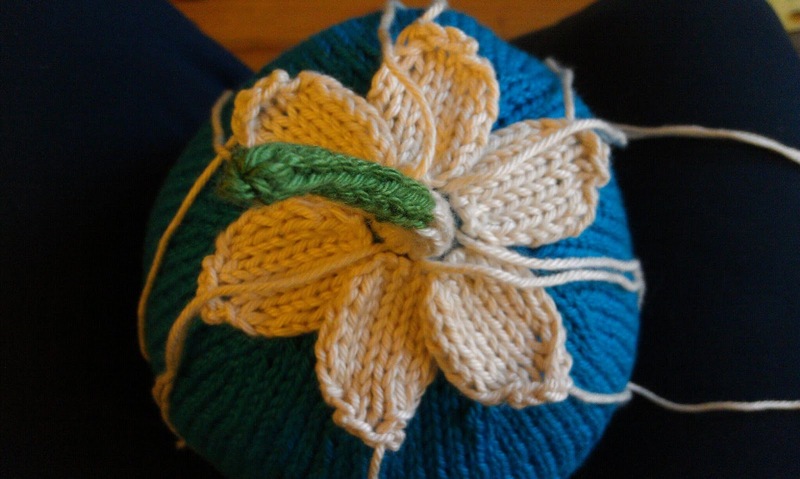 Since I am using smaller needles and smaller yarn, I am going to cast on 72 stitches and follow the directions for the 6-12 month hat. This should, however, fit a much smaller baby. Between Newborn and 0-6 month based on my calculations above. Made Row 10 of the petals purl-wise rather than K wise as written. Even though there were 6 petals, they all knit up pretty quickly. 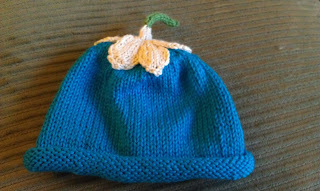 I finished this pretty late at night so I waited until the next morning to sew them to the hat. 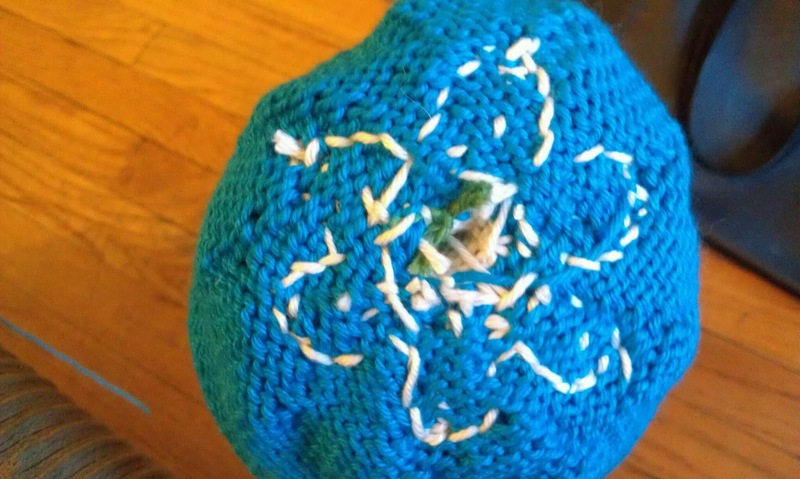 This project consumed 33 g blue, less than 1 g of green and 6 g of white. 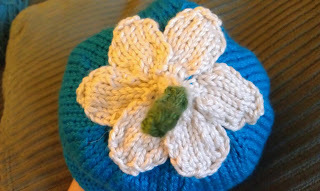 The finished size is 13” circumference, 6” from rolled brim to base of stem (white part of the stem). The brim can be rolled more if necessary.